artist Sandra Kuck by clicking on her individual art titles. around and comparing various prices, knowing that our Price Match Guarantee will let you purchase Sandra Kuck art at the lowest prices guaranteed! Helping Hand and other artwork by artist Sandra Kuck can be viewed in our artist slideshow. Helping Hand by artist Sandra Kuck and other Sandra Kook art, art work, artwork, canvases, giclees, images, limited editions, open editions, paintings, paper, pictures, posters, and prints can all be found at Christ-Centered Art. 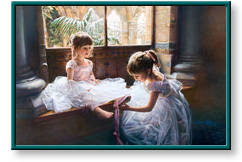 Helping Hand depicts two lovely, adorable little girls in their ballet costumes. As they enjoy spending their time practicing, the youngest seems to need a Helping Hand with her shoes while the older girl (perhaps her sister) is very willing to assist with the slippers. Let the dance begin! This unframed open edition paper print is digitally printed directly from a computer onto paper. This unframed limited edition paper print comes mint in its original folio, includes a genuine certificate of authenticity from Somerset Fine Art, and is individually numbered and hand signed by the artist Sandra Kuck. This unframed limited edition canvas comes mint in its original packaging, is unstretched, has a genuine certificate of authenticity from Somerset Fine Art, and is individually numbered and hand signed by the artist Sandra Kuck. Helping Hand by artist Sandra Kuck as well as other open and limited edition nostalgic Victorian art prints and canvases, giclees, images, lithographs, paintings, pictures, posters, and reproductions by renowned Somerset Fine Art, Somerset House Publishing, and VF Fine Arts artist Sandra Kuck can be viewed and purchased at special sale prices at Christ-Centered Art.